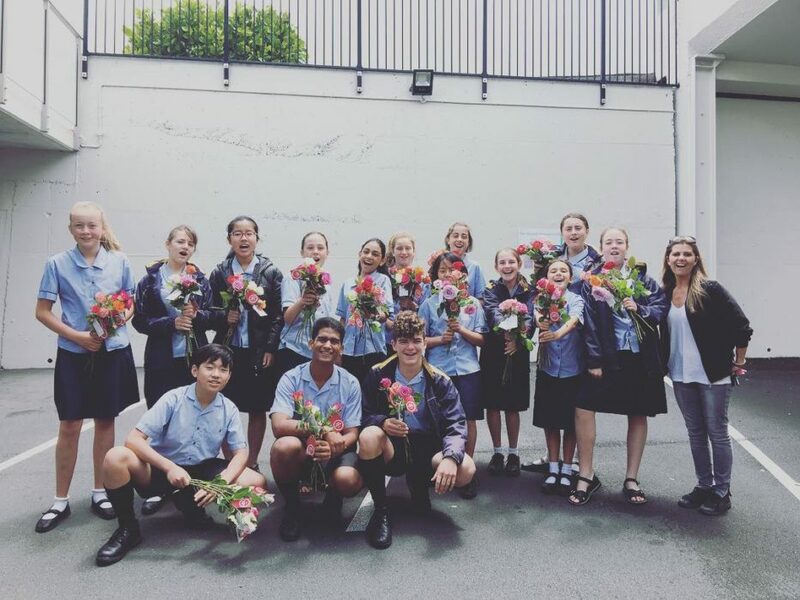 On Thursday December 6, 20 Bucklands Beach Intermediate students went out to make a positive difference in their community by giving out flowers and kind words to Howick residents while changing their mindsets. The students involved were part of an initiative called OAK- Organised Acts of Kindness. Originally pioneered by four student leaders, the initial purpose of OAK was to spread kindness in a thoughtful and consistent manner at BBI to strengthen the culture of the school. Explaining a deeper motive, the leaders referred to a recent study that revealed that depression isn’t always caused by lack of serotonin; it can instead be a lack of satisfaction in ‘psychological needs’—the need to feel that you belong, are valued and good at a certain discipline. With kindness, all of these needs can be fulfilled as it recognises and appreciates all of the aforementioned aspects an individual may possess. “Meaning that kindness can make others feel good particularly in this crazy season where people might feel isolated, depressed, lonely or stressed, which is exactly what we want to do.” Shafquat Tabeebadded. The team started by giving out frameworks of creative ideas regarding kindness to those students that were interested. Around 70 students had participated and made a huge difference in the school. Lexie Buchanan said “it was an astonishing, outstanding achievement!”. OAK at school was a stepping stone to the hands-on, more impactful plan for action on the community. Holly Ensor, owner of The Flower Bar, kindly donated 200 roses for the students to give out. From the 70 students, 20 enthusiastic students were involved in this. Sixteen passionate students were giving out flowers and kind words in the main street of Howick. The people who received these free gifts were particularly surprised. Some special ones even replied saying that they weren’t feeling so well until we came up! With each new adult, the vibe of Picton Street became more and more welcoming. Enthusiasm grew in every student’s expressions and smiles were contagious with every exchange! “Seeing the look on people’s faces when they realised the flowers were free and for them was priceless!” Shafquat said. “Yeah, it was a ripple effect too; some adults even gave us treats in return!” Lachlan Wallace chimed in. Meanwhile, four students went to a rest home and gave out beautiful flowers to the elderly. It made them smile. ‘They were so smiley and it made us feel good to make them happy!” Claire Pare told everyone with a grin on her face. Mark Stevenson, Deputy Principal at BBI and mentor for OAK,was particularly pleased with what the group had accomplished. The four student leaders will be coming back to BBI from College next year to sustain and enhance this initiative even further. Rest assured, Howick is in good hands!